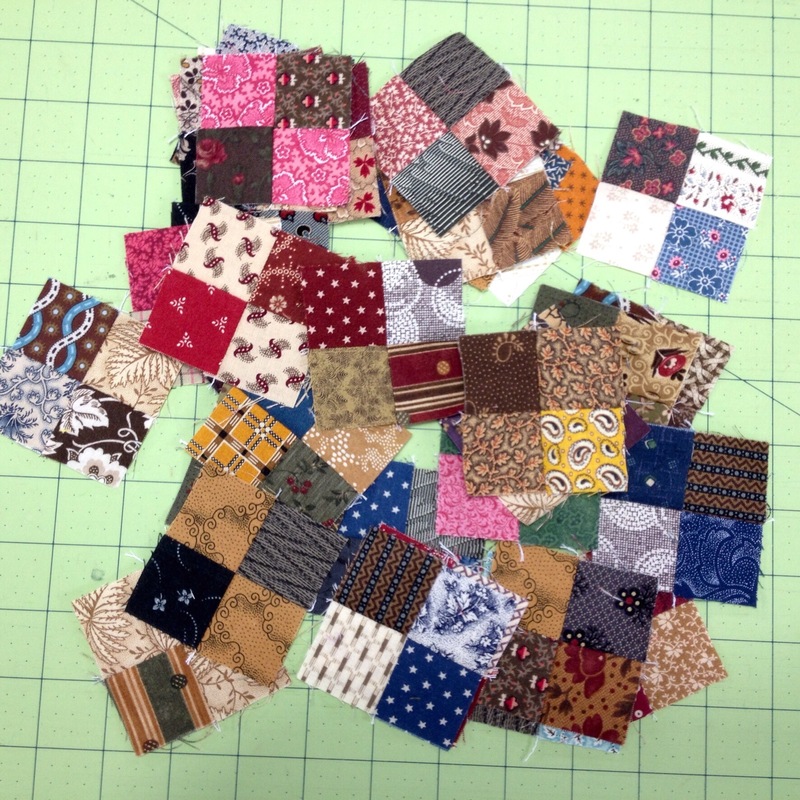 Lori at Humble Quilts posted a picture yesterday of a small quilt she had made using a kit sent to her by Wendy from The Constant Quilter. You can see Lori’s quilt here. It is adorable! If you haven’t seen Wendy’s blog, check it out. I have followed her for quite some time. She does beautiful work! Anyway, this little quilt of Lori’s inspired me to dig out my little 4 patches I had been making as leaders/enders earlier this year. Then I just needed to find the perfect piece for the center. 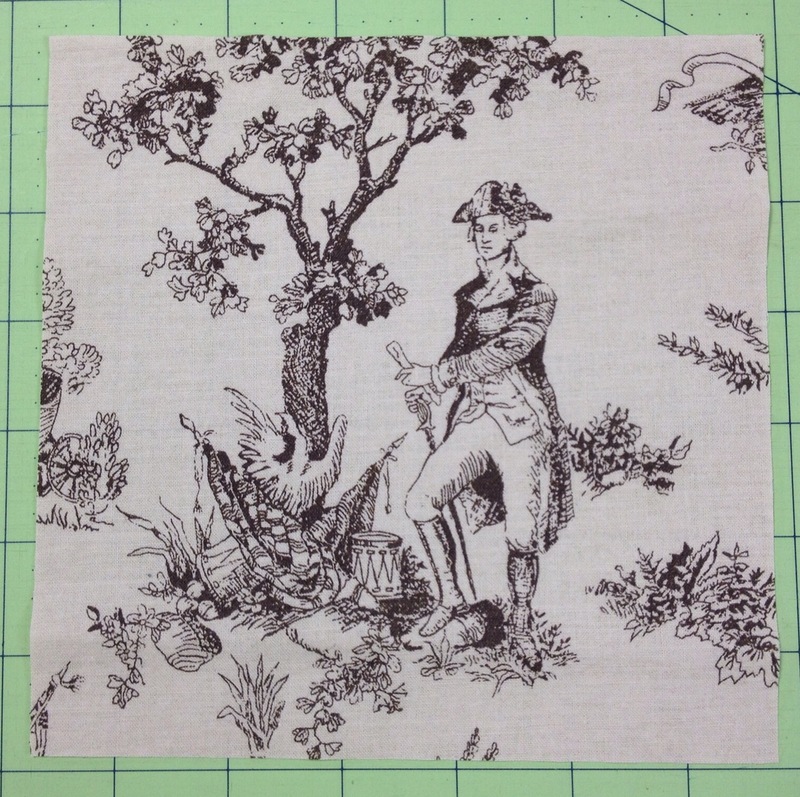 It didn’t take me long to come across a remnant of a fat quarter that had the perfect print of George Washington. Of course, now that I think about it, I might have a good piece with Lincoln on it…hmmmm…. Oops! It is Pittsburg Paints Grand Distinction and I bought it at Menard’s. It has primer in it! 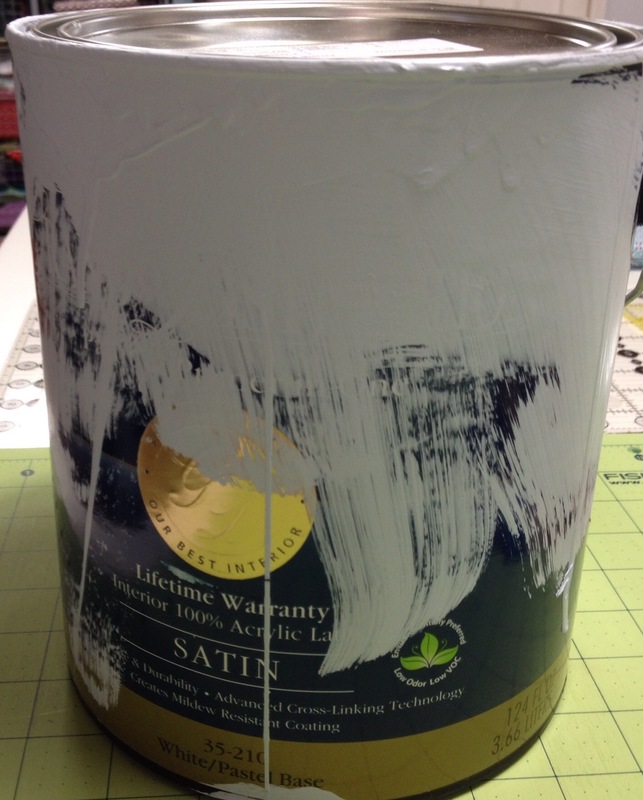 I think this is the best paint I have ever used. I finished painting the walls late Sunday night. Apparently too late as now I need to paint the trim. Sigh. And yes, I know I should have done that first. I also cleaned carpets and mowed the lawn yesterday so last night I was too tired to sew. Imagine that! I got my 4 patches out and George cut out and that was it. I hope to do a bit of sewing before work this morning. Have a great day! That is going to be a nice quilt piece, if you can stop painting long enough to sew, LOL!! I can’t really say anything, as I painted my sewing room three times before I was happy with the color. Saw Lori’s little quilt–loved it. You are well on your way, if you can get away from being a one-woman home maintenance department. Good grief, Woman! Between painting a room, cleaning carpets and cutting the lawn…you wore ME out! Oh, I saw that mini on Lori’s blog! So fun to find inspiration from Blogger-buddies, haha! Oh, and as writing I just spotted your IG photo – your mini looks great!! Yay on just the two coats. I wouldn’t have been surprised if you would have reported that it needed a third coat. Hope you are able to get in some sewing today. Those four-patches look ready for a mini – look forward to seeing the results!